Earthquakes can also occur far from the edges of tectonic plates, along faults. Faults are cracks in the lithosphere caused by the stresses created as sections of a plate (or two plates) are moving in different directions. In this case, the earthquake event is called a slip. There are a number of different types of faults, but most can be divided into three categories: strike-slip faults, normal faults, and thrust faults. A strike slip fault occurs in an area where two plates are sliding past each other. In relation to the ground surface the slip involves sideway movement. Strike-slip faults are found in California, the San Andreas fault being the most famous which has caused many powerful earthquakes. Normal faults cracks where one mass of rock slides downward and pulls away from another mass of rock. As these plates are slowly splitting apart and pulling away from each other the normal faults are formed in this way. 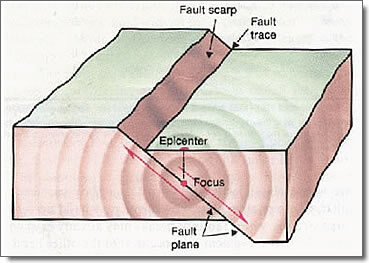 Normal faults are associated with downward movement on a sloping fault as the two plates move apart. The stretching of the Earth's crust is indicative of this type of event. Deep sea ridges in the Atlantic and Pacific are where the largest normal faults are formed along these ridges. Thrust faults are caused by plates pulling apart and colliding with continental plates. A thrust fault happens when plates are being pushed together. This involves upward movement as the two plates collide and buckle upwards. This kind of event signifies a compression of the Earth's crust. The focus of an earthquake is where pressure builds along a fault line which fails deep underneath the crust of the Earth. The point directly above the focus is termed the epicenter.